Custom payment schedules are very customizable to fit almost any schedule of payments you’d like your client to be responsible for on their order. 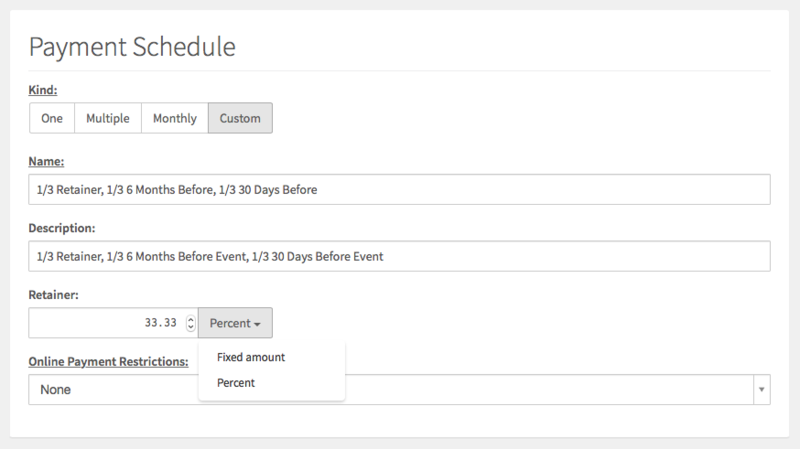 To start, you’ll choose Custom in the Kind option when creating a new custom payment schedule. Give your payment schedule a name and description for your own reference, then it’s time to start customizing! Below we’re going to go through a sample custom payment schedule that requires the client to pay a retainer of 1/3 of the total order amount, followed by 2 additional payments of 1/3 each. The first step when creating a payment schedule with more than one payment is to set a retainer amount, if you want the client to pay a certain amount up front. Táve will automatically set the due date for the retainer payment as the same as the job booking date. When establishing your Retainer, you have the option of choosing a percentage of the order’s total or a fixed dollar amount. As you see below, since we want to require 1/3 of the total to be paid up front, I’ve set the retainer to 33.33%. To set up the second payment under this custom payment schedule, you’ll then click on the New Payment button, where the window below will appear and you can customize the terms of the second payment. Here, we want another payment of 1/3 (33.33%) due 6 months prior to the session or event (the job date). I’ve again chosen 33.33 percent of the order as the amount due, then I’ve selected “before job date” and entered 6 months. This will cause the client’s second invoice valued at 1/3 of the order’s total to be due exactly 6 months before the primary session or event scheduled on their job. For the final payment due on this custom schedule, I’ve selected New Payment once again and chosen something a little different from before. Although we want this final payment to be the same, 1/3 (33.33%) of the total order, it’s always recommended to make the final payment due valued at 100% of the balance. This will cover any instances where a client has prepaid any portion of their balance or, should the order total increase for any reason, it will generate the final invoice on the order to reflect the entire outstanding balance due. Here, we’ve set it to be due 30 days before the job date, similarly to the one before, only choosing days instead of months in the dropdown.